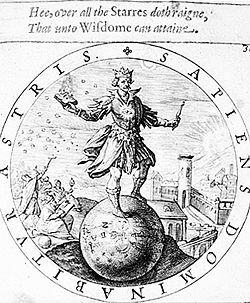 The words of this old print read, in modern English: 'He over all the stars does reign That unto wisdom can attain', in other words: 'Whoever can become wise will rule over everything. Wisdom is knowing things that help a person to live sensibly and make good decisions. Wisdom is defined differently by many cultures. Some say that wisdom is something a person learns as they grow older. Other cultures expect people to complete certain rituals in order to get wisdom. If someone has wisdom we say he is wise. Most cultures from the past have had special people who were supposed to be wise. People asked them for advice when they had problems because they knew things that ordinary people did not know or could not know. They were often called "sages". There are many stories in Western culture in which the owl is supposed to be a wise bird. There is a new conversation on Wisdom in an ebook called 'The composition of Wisdom'. It is about the mind which is 'Wise'. Wisdom is an important discussion that people could engage in. This page was last changed on 18 October 2018, at 18:23.